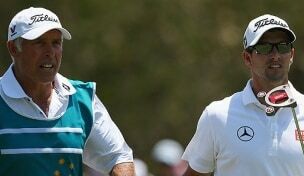 He really helped Adam in reading the last winning putt during the Master 2013 sudden death playoff with Angel Caberra ... It was raining and the sky was getting dark ... As such, he could not read the line of putt clearly. Hence, Stevie guided him and he sank the putt to pick up the major championship ... Of course Adam's putting skill and speed were very crucial too. Caddie can only advise by providing the tour player their experiences on the green but when it comes to executions, every player does so ever so differently. Stevie had been with Greg Norman but how many wins did they get? Stevie n woods went otherwise as woods was already dominating before they paired up.